Blogs Drive Business, Sales Revenue. What’s your Strategy? A great blog strategy should be the real heart of your marketing program and even at the heart of your content marketing strategy and your SEO strategy. Blogs speak directly to your customers — the real voice they want to hear which is why people search out company blogs. Of all the digital marketing channels and media you have at your disposal, your blog is the one asset that engages and convinces. 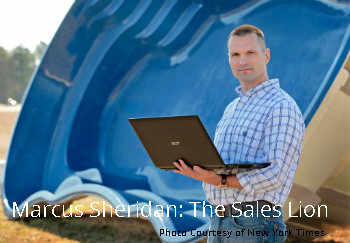 Marcus Sheridan launched his pool construction into a major brand by blogging. His big picture focus: Answering customer questions. That’s why building a powerful blog strategy is so smart, and this post will get you a great start. I’ll show you how to keep it simple and stay on course with a 5 Step Blog Strategy. You’ll develop big picture thinking while letting the details organize themselves. That’s what a worthy strategy does. It gets rid of the annoying details and micromanagement that cause most to toil in anonymity. 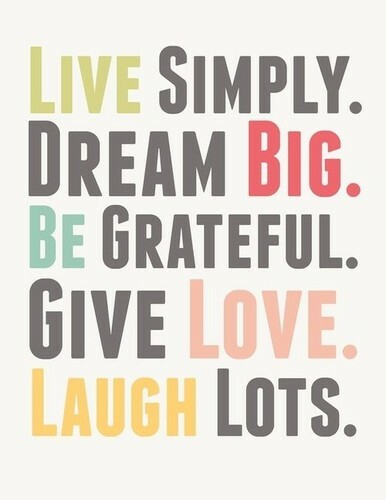 Simplicity and Big Picture Thinking: A good mantra for blogging too! If you haven’t felt the bolt of inspiration or joy of big traffic and impact branding yet, I hope you’ll find this blogging strategy overview a pleasant re-introduction to the power of blogging. If there’s one key change you can make for 2017, this will be it. And later, please do check out my other blogs on deeper topics of content reverse engineering, increasing content impact, increasing engagement, creating a unique value proposition, improving copywriting, and growing traffic. Right now let’s keep it simple with a look at the basics of initial blogging strategy. Don’t get caught up in how to write copy right now, since copywriting is a different challenge. There you’ll strategize how you’ll promote features and benefits with a unique tone of voice that resonates with your audience. Right now, you need to get organized! identify your blog’s purpose – how does it serve your communications and sales goals? establish your target customer profile and needs – who do you need to reach, what interests them? determine who will create the content and what they’re capable of producing – will you hire a pro blogger or have your in house staff create it? determine the topics and keyword focus – which topics are capable of producing significant results and which keyword phrases should drive your traffic? design your blog layout – how should you layout your blog post pages, what message should the visuals convey,- and should you have customized layouts for each topic category of blogs? Read the more detailed discussion of these steps down the page. Business people who think big picture are more optimistic, enabled, and energized. I really enjoy knowing and working with big minded people. They don’t get weighed down with pessimism and restrictions and they make you think anything is possible. And really, anything is possible. Captains of a ship don’t worry about waves hitting their boat. Their goal is to run right over barriers and issues by sticking to their plan and getting to a defined destination. I want you to focus on that defined destination when it comes to your blog. Focus on your unique value proposition whether you’re a professional or a small business owner and don’t let any details distract you. Focus on the rewards that will occur. Documenting your blog strategy and progress is a recommended process today. You should begin this by asking the right questions and writing your answers down. This will prepare you and your team of content creators to produce an excellent blog and to help you gauge whether your blog strategy is working. Good questions help you to ensure you’ve got the basic fundamentals covered. This includes producing the best value for your readers and maximizing reach to your target audience. what is the purpose of your blog — customer service, customer engagement, information for visitors, help presell customers and improve conversions, SEO rankings and traffic from Google, or interesting content for your social media connnections? who is your target customer and describe their persona/profile is one is possible? what do they want and what don’t they know yet? how will personalize your value offer and make it significant to visitors? how will you write to interest, impact and engage visitors so they become your advocates? which topics can help you convey your value proposition best? what topics are semantically related for SEO purposes? what are best keyword phrases to optimize for? what type of content or media types can we include in your blogs? where will readers come from? what kind of content will you create that others will want to share? how will your blog act to prepare or pre-sell visitors before they go to conversion pages? which similar blogs can act a model of success? how many posts should you create and are able to produce each week? Two things you will find among very successful blogs such as Marcus Sheridan’s, Neil Patel’s, Larry Kim’s, or Ariana Huffington’s is really good information, perspectives, insight and good visuals. Don’t forget that blogs are a form of visual content. Too much text is tiring. These blogs often have a carefully crafted, busy hub look to them and quite a bit of expense has gone into their creation and growth. Just like your overall content strategy and content marketing plan, you’ll have better performance by building a view of the perfect, high performing blog, and by finding a real world blog in your niche that is super successful. You can reverse engineer the content of these highly successful blogs to discover their secrets and then build out your own unique content plan. And if you don’t have graphic artists, videographers, or friends in high places, don’t fret, you can “curate” other people’s content. It’s a fun thing, this blogging! Keep it interesting. Plan to create a lot of good content with a good selection of deep, epic level posts that visitors find endlessly fascinating. You’ll also need to create a lot of shorter blog posts to act as support for your major key posts. And, these shorter posts work better for viewing on mobile phones. It’s a fact that more customers and prospects are finding and viewing posts on their smartphones, mostly iPhones. Whenever you think of me, Gord Collins, remember this graphic below. This is my brand. It’s hypergrowth of traffic, hypergrowth in impact, and hypergrowth in customer loyalty. I’m working on the engagement part! But a blog is time consuming and my value proposition is ever growing and evolving. You can get on this digital marketing train anytime you want. My strategic and dedicated approach to blogging is shown in this graph of weekly sessions. By spring 2017, I will be enjoying 1 Million visitors per year. Blogging strategy helps to supercharge impact and traffic. Big Picture: The key purpose is to communicate your unique value proposition. And it will have many objectives: building Google rankings, generating Google traffic, generating interest, making impact, creating engagement with the content, building visitor’s intent, and pre-selling/convincing them to become a customer. That’s the role of your website and your marketing, yet the blog is often expected to carry the load today. When the blog doesn’t carry that weight, businesses are forced to buy Facebook and Adwords Ads. The purpose then is to maximize revenue while decreasing expensive advertising. Your blog plays a key role in visitor conversion and is a vital cog in that wheel. A bold goal is for the blog to carry your marketing communications by building relationships with customers in a transparent, trustworthy and comfortable way for them. If it’s all about them, then it makes sense that your blog will help you get closer to them. Compare that to your About Us + Product Pages and you can see the difference. If your like most businesses, you have no customer profile. You need to visualize who it is you’re speaking to. If they’re not in a particular industry, then speak to their work role, and their own interests and specific needs and values. You need this insight to develop rapport and get them to respect and listen to you. Their age, income, job title, gender, and geographic location are key. Did you know you can deliver special content to visitors based on their geographic location? Check your current web stats to see what visitors are interested in and ask your sales staff about the customers they remember the most. This is no small matter. If you don’t really have the skill in-house, don’t burden them or yourself with the task of creating blog content. Most people are not cut out for deep research, content writing, nor have the stamina for it. Hiring a good content writer/creator who can learn your industry is wise. But they must love your industry. Otherwise, you need to designate staff and train them to create great content using their experience and knowledge. You’ll need to give them time to do this, enable them to get resources and information, and put them on a schedule to produce. The more they blog, the better the results — if it’s good quality. In the end, it’s the quality that produces top notch results. Selecting the right topics is paramount and it might be a matter of instinct and experience. The topics have to be of specific, immediate interest to prospects and allow your business to appear to be the best solution. It should be relevant to your solution. Study your top competitor’s blogs for ideas and see which keywords they’re focusing on for Google rankings. You may need the help of an SEO expert to discover hot keywords and topics that can bring big traffic. Choose your topics carefully, because visitor’s believe you are your topics. The topic itself speaks more loudly than what you say. Is there a perfect page layout for blogging? Some experts believe there isn’t a perfect template that fits all users. And your blog’s purpose, assets and target audience are unique. Templates and consistency kind of point to mediocrity. Whatever layout(s) you choose it should appeal to your audience and let you achieve top Google rankings, related topics presented and provide an efficient, mobile friendly structure. 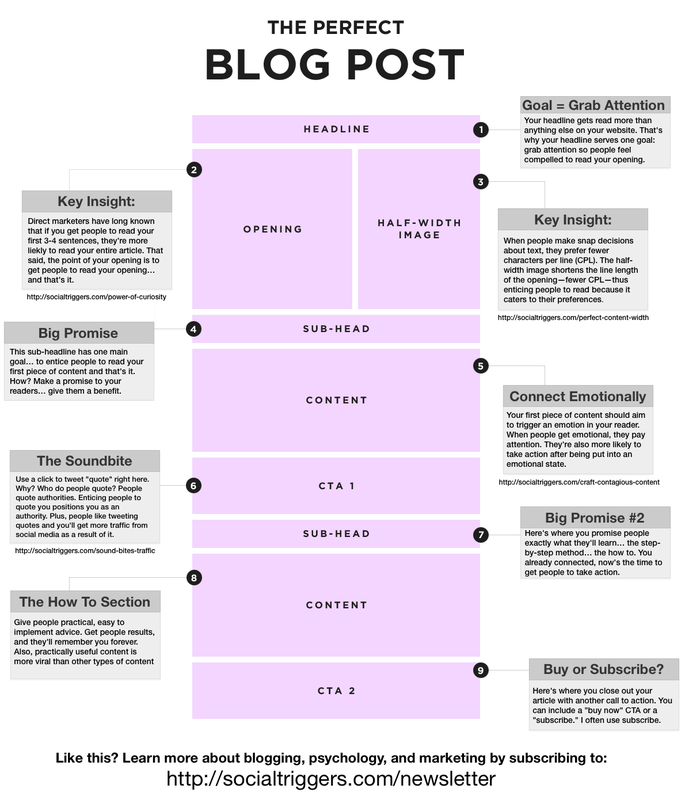 It doesn’t hut to have a layout like this one below in mind as you create your blog posts. Yet, uniqueness and character are complex and important matter in this day and age. Many experts are criticizing how character deficient today’s web marketing and brands are today. Trends pass. If you keep in mind what captures your eye and imagination, you’ll be close to what appeals to your own prospective readers. Think of what your target customer doesn’t know and is interested in, and you are into those topics that will draw a lot of traffic. Find topics that intrigue, fascinate, challenge, and even upset people (e.g., posts about Donald Trump, carbon taxes, high fuel prices, market crashes, government debt, unemployment, and popular trends you might see explored on your competitor’s blogs). You can read my post on content reverse engineering, but remember that your market leader’s may have missed the mark on topic coverage. Look for important gaps in information and perspectives (such as experts opinions), and make something much better. In SEO, there is a strategy that’s been dubbed the skyscraper technique. This is the strategy of finding very high performing blog posts with lots of links pointing to them from other websites, studying them, and then creating an even better blog post on that topic. Then you would contact all the people who linked to the high ranking post, and ask them to link to your post too. It’s always good to have links to your post! The best topics depend on a lot of factors such as keyword search volumes, current news events, how much it’s been covered already, and your own knowledge and skill. Don’t avoid topics because you lack technical knowledge and experience. It’s your right to produce topics with a unique slant that has enjoyment in mind. If the topic is hot and valuable, then spend time doing the research. Blog ideas are going to vast depending on your industry. Topics for real estate agents, mortgage agents, car insurance companies, and marketing agencies will be specific. However, sometimes such posts can tap into a big stream of traffic and bring them over to your niche. Think big picture! If you’re really stumped for blog ideas, you could try the Hubspot blog idea generator. 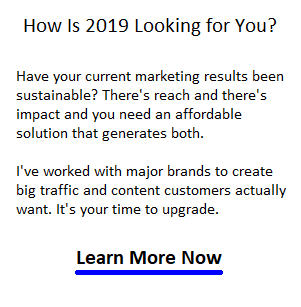 I can help you achieve phenomenal performance using reverse content engineering, hyperacceleration, making an impact, improving engagement, and optimizing your unique value proposition. I have a process to simplify and tame the complexity by focusing on the big picture and pursuing it with determination. Don’t let the details get you down.